Buried beneath a quiet suburb of Ottawa, Ontario lies a relic of the Cold War. Until recently the village of Carp had a top-secret military base whose true purpose Canadians could only speculate about. With the end of the Cold War, the base was decommissioned in 1994 and the truth can now be told. Can you see the 100,000 square foot, four-story building? Neither can the enemy! Carp’s underground secret is the world’s second largest bomb shelter: the Diefenbunker. (The largest bunker is in Cheyenne Mountain, Colorado.) 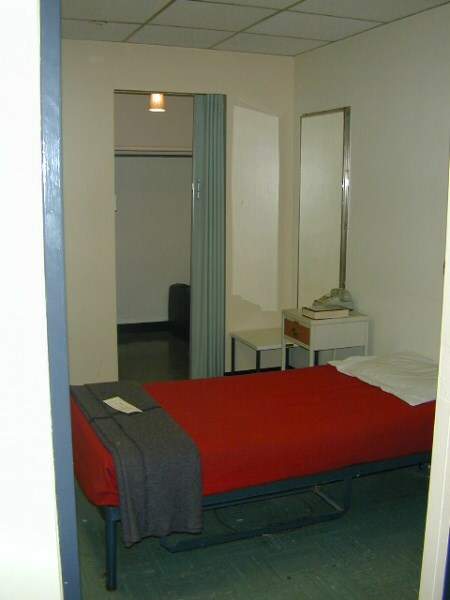 Named after Prime Minister Diefenbaker, who commissioned it in 1959, the bunker was to serve as the official shelter of the Canadian government and key military and civil service personnel. Fortunately, the Diefenbunker was never used for its purpose. 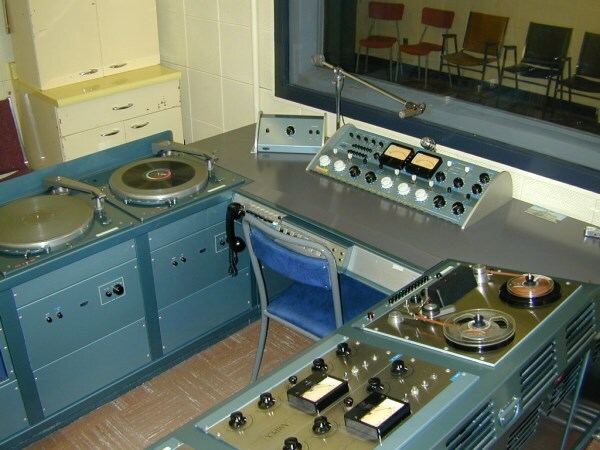 Operational from 1961 to 1994, it is now maintained as a museum of the Cold War. 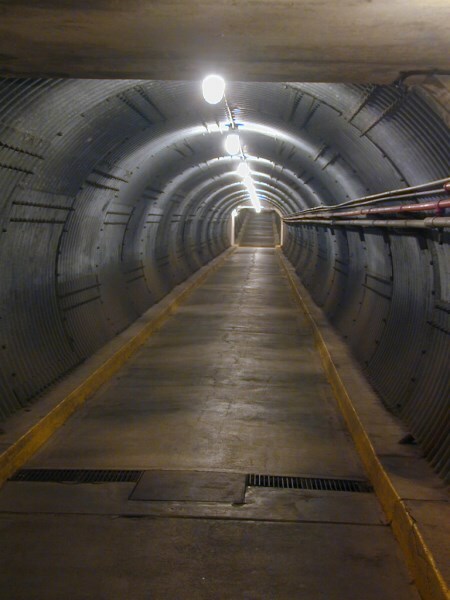 The Diefenbunker is one of the only high-level shelters in the world that is open to the public to tour. In the event of a nuclear war the Prime Minister and key cabinet ministers would maintain the Canadian government from this location under the “Continuance of Government” program. Five hundred plus people could stay there for 30 days. Oddly enough, of that 500 none of them were family members. Even the Prime Minister could not bring his/her family. The bunker is four stories deep and 100,000 square feet. The place really is an engineering marvel. 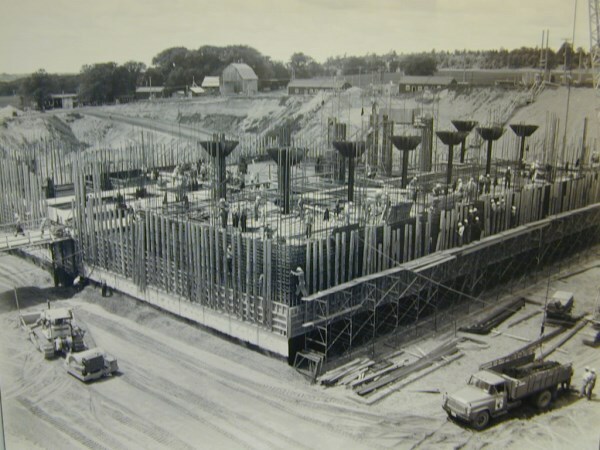 Construction began in 1959 and took 20 months to complete, an engineering/construction marvel. 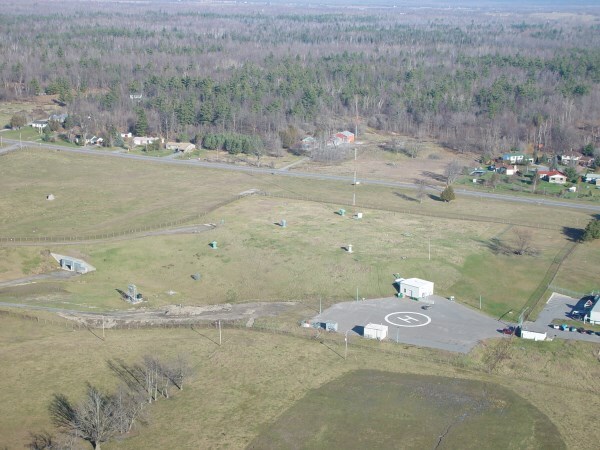 The facility was formally decommissioned in 1994, stripped empty by the military and sold to the Township of West Carleton. Not knowing quite what to do with the underground facility and unable to find a suitable buyer, the township made plans to pour concrete down the blast tunnel and air vents, effectively sealing the building forever. A group of concerned citizens successfully lobbied to have the plan stopped. The facility became a volunteer run and managed quasi-museum that ultimately matured into the professional museum it is today. You’ll descend into the bunker via the 378 foot long blast tunnel. The dark, damp tunnel provides an eerie start to the tour. Opened at both ends, it was designed to allow the pressure from the nuclear blast to go in one end of the tunnel and out the other, taking the pressure off the main doors that are located half-way along the tunnel. The Bunker was designed to withstand a 5-megaton nuclear ground burst, 1.1 mile away. A 5-megaton bomb is 250 times the size of the atomic bomb that was dropped on Hiroshima August 6, 1945, effectively ending World War Two. In the event that a key someone did not make it into the bunker in time but survived the blast this is where they scrubbed clean of any nuclear contamination. This is where all top-level communications would have been. If there were imminent bombings, they sounded sirens all across Canada. Sources both military and civilian from all over Canada and the world (including Cheyenne Mountain) would plot the destruction. This is where the civilian authorities would have plotted the situation including what destruction had occurred and coordinated an organized response to the emergency. God forbid, that in the event of a nuclear war, Canada go without our beloved CBC (Canada’s Broadcast Corporation). How would we survive without “Hockey Night in Canada”? Seriously, it would have been the only communication link for surviving Canadians. The equipment is still operational and sits on a vibration-proof floor. The ‘studio’ part, where the announcer would have been, can be seen through the glass. 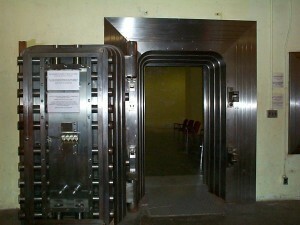 A secret plan was devised to bring Canada’s gold stash from its vault at the Bank of Canada to the Diefenbunker. The primary purpose in protecting our gold reserves was to have the resources to buy food, medical, and other supplies once the attack was over. 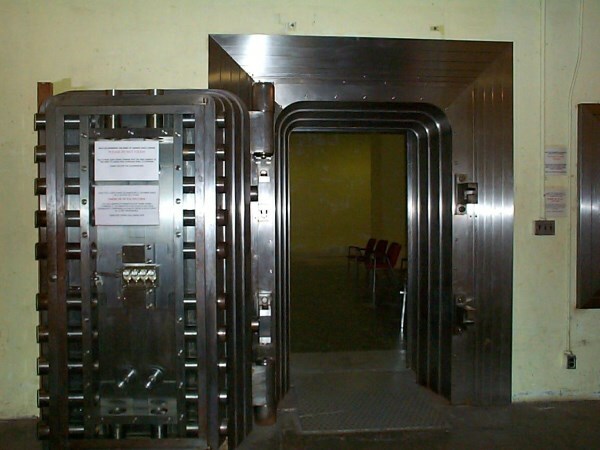 Although the vault is almost 70 feet underground, the Government still felt it necessary to use 10-ton door with 6-combination locks to keep the contents safe. Quite a contrast from the splendor of 24 Sussex, the Prime Minister would have to make do with very spartan quarters and a cot for a bed. 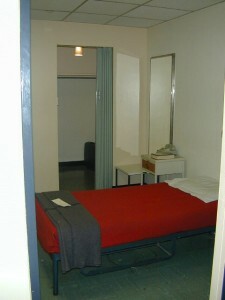 The suite of rooms contained an outer office for the secretarial staff, an inner office for the Prime Minister, a bedroom with a single bed, and finally, a bathroom. The Prime Minister was one of only 2 people to merit a private bathroom, the other being the Governor General. I guess that even in a nuclear holocaust it would be too unseemly for the Prime Minister to share a bathroom. In addition to seeing the offices for various ministers and deputy ministers, you’ll see several departmental offices for those government departments assigned to the facility. These offices would have had to be staffed around the clock. The tour is fascinating and is one of the most enjoyable “historical” tours I’ve been on anywhere in the world. First, there’s the great fun of exploring creepy subterranean mysteries. Secondly, the Diefenbunker provides an interesting glimpse into the hysteria of the Cold War in a contextual setting that really delivers the message. I want to thank Glen Farrelly for his August 2000 article that I found and mercilessly plagiarized. My apologies Glen.